Are Aid Donors Walking their Own Talk? A new study on donor transparency shows that many aid agencies are not putting into practice the levels of disclosure that they typically demand from the governments which receive their money. 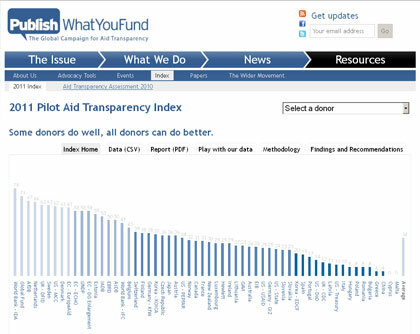 Produced by Publish What You Fund, the global campaign for aid transparency, the study compiles an index to see how different donor agencies measure-up when it comes to opening up their own books on how much aid they give, where and what for. The index looks at 58 agencies, ranging from the World Bank’s International Development Association (the top performer) to Malta’s Ministry of Foreign Affairs (the worst performer). In many cases, different agencies within the same institution or for the country are assessed. For example, three agencies from the EU and four from the United States are separately analysed to see how easy it is to follow the flow of the money. Overall 11 of the 15 worst performers on the index are EU member states. These include Spain, Portugal, Latvia, Italy, Poland and Hungary. The degree of low-quality aid information provided by donors can be startling. In completing the study, the only information found on one of France’s top aid recipients, Cote d’Ivoire was about a project commemorating two decades worth of research on chimpanzees. In the case of Austria, the figures showed that the fourth biggest recipient of the country’s aid agency’s funding was the government of Austria. These examples may seem humorous but they are worrying given the sums and stakes at play. In 2010, the latest year for figures on official development assistance, US$ 128 billion was spent on aid. These monies are supposed to be producing development results and helping the world’s poorest change their lives and futures. But without timely, comparable and accessible information on the money be given, it is impossible to assess whether such outcomes are happening. By keeping donors’ books closed, there is a risk of waste, mismanagement and corruption. Greater levels of transparency should be the norm, not the exception, for development efforts to be effective. Donors often urge partner governments to take measures that institutionalise transparency, accountability and integrity. From an aid effectiveness argument, these good practices make sense as they have been seen as having a real development pay-off. The question is, why are donors not doing the same?